Idol group Fahrenheit last weekend had two consecutive concerts for their grand finale. What should of been a happy celebratory party turned into a party surrounding information regarding their contracts and also the question of whether Wu Chun will fly solo. Fahrenheit frankly replied and said that their mood had been affected by the reports, they hope everyone can focus their attention onto their efforts they've put into the concerts. 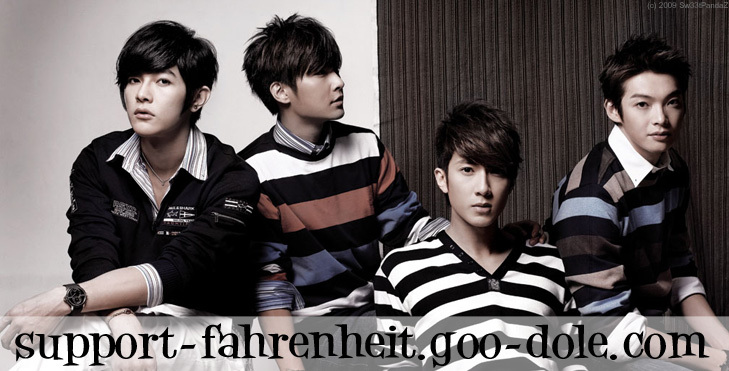 The question regarding Fahrenheit's contract has been a hot topic, the 4 members came forward to especially explain the situation. Calvin Chen stated "The contract still has 2 years, there's no problem with the renewal of contracts. Within the group, the developments of each member will have their own ups and downs, Fahrenheit's work schedule has always had a schedule for each member and also a schedule for all 4 group members". He also said at present the new album is in the middle of being recorded and they have been continuously taking on advertising endorsements, "Not caring what the outside world says, as long as Fahrenheit exists there will be 4 members". Accused of delaying the renewal of his contract Wu Chun said "it (contract) has been discussed, but the contract hasn't even ended!" Regarding the loss of Wu Chun, Fahrenheit would become a crippled ship, Arron Yan humorously replied "Even if we do become a crippled ship, we will not find a new ship." Fahrenheit's 1st show was almost a full turn out, but the 2nd show had only sold about 80% of the tickets, they expressed "Before going on stage we were told about the situation of our box office sales, but to hold how many shows it not something we decide, we're actually a little disappointed but this will make Fahrenheit work even harder, hoping in the next concert we will have more people to come support us."